December 6, 2015 | By admin | No Comments | Filed in: Charity, Coaching, Game Shooting, General. October 16, 2014 | By John Farley | No Comments | Filed in: Coaching, Game Shooting. 25th September 2014 I organised a shoot for the Wilbury Travellers syndicate at Cockley Cley. 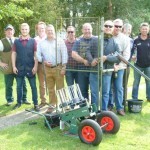 Following a whirlwind tour of Scotland and Yorkshire at the beginning of the grouse shooting season, on the 19th September 2014 we took a party of Sayes Park more regular clients attend the Howesdyke moor shoot, near Bedale, Yorkshire.